Miami South Beach was the place to be from December 6th to 10th for everything art and design. Design Miami Galleries and Art Basel Miami Beach happened at the same time during the second weekend in December. The streets of Miami were flooded with large exhibitions and installations. The hotel and fashion scene even joined in on all the festivities. Check out some clips from the weekend below! One of the most anticipated additions to the fair’s list of exhibitors was Salem-based Shaker furniture expert John Keith Russell, who has been dealing since 1979. Maniera presented a solo exhibition by Bijoy Jain’s Studio Mumbai, entitled ‘I like the moon during the day’. Studio Mumbai incorporates skilled craftsmen trained in traditional Indian building techniques who work in the same environment with architects. New York gallery Converso brings a taste of desert minimalism to Miami, presenting a solo exhibition of designs by Swiss-born architect (and erstwhile Palm Springs resident) Albert Frey. 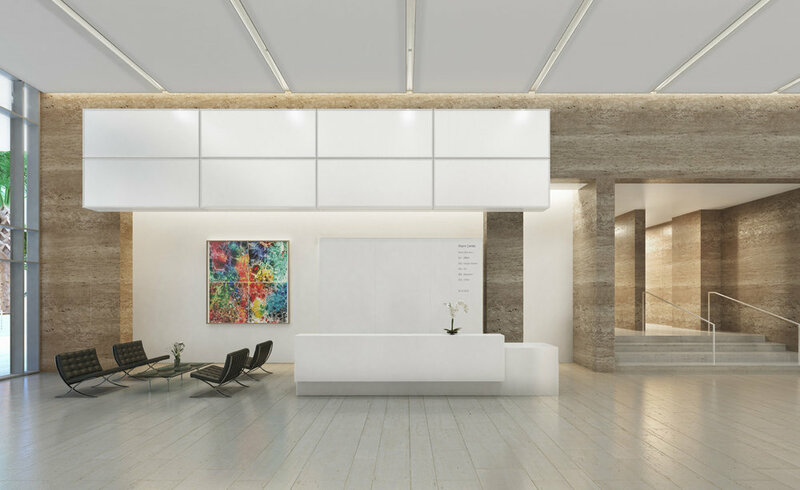 One of Miami’s stalwart office buildings which dates back to 1983, the Citigroup Center in Downtown Miami revealed a sleek new Richard Meier-designed lobby in style during Design Miami. The most instagrammed installation of Salone del Mobile is back: Marc Ange has set his pink oasis, created for Holy Handmade!, to unreachable heights outside the Faena Hotel, and countered it with new pieces, ‘Les Araignées’. Polar-opposite in mood, the range of armchairs are covered in Sunbrella fabric and evoke an ominous essence of spiders. COS and Studio Swine have recreated their mesmerising Salone del Mobile installation inside Miami’s art deco Temple House. On the opposite end of the spectrum to the darkened space that hosted the Italian version, the US iteration has been reimagined in white COS minimalism, overlooked by tropical palms. The Herzog & de Meuron-designed 1111 Lincoln Road carpark served as a dramatic backdrop for Eden by Perrier-Jouët – the vibrant crescendo of the brand's creative partnership with Luftwerk this year. Demisch Danant is injecting a spot of colour into proceedings, presenting furniture by Pierre Paulin, Maria Pergay and more against a soothing pink ombré backdrop – cue the Instagram frenzy. Magen H gallery hosted a retrospective of works by the late French designer Pierre Chapo – an eye-catching Max Truninger tapestry and Aglae Liberaki sculptures complemented the his designs. The sculptural works of brothers Mike and Doug Starn adorned Cristina Grajales Gallery’s booth at the fair this year. The conceptual furniture designs were made up of an interlacing bamboo and rock-climbing rope. 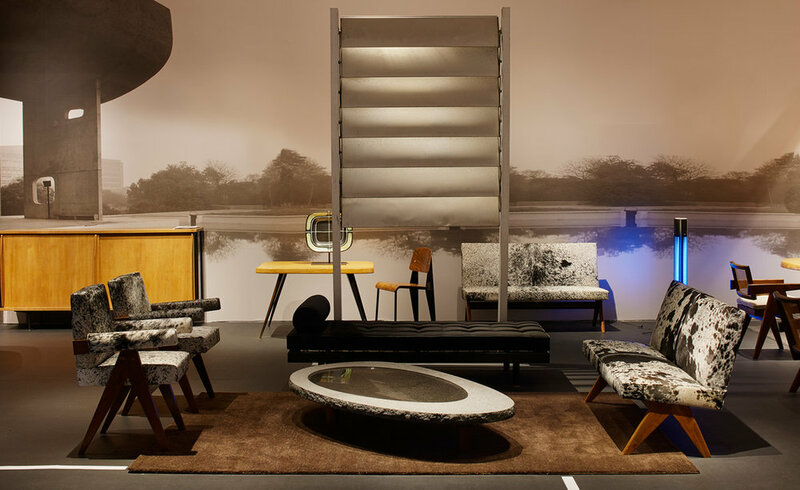 Paris-based Laffanour Galerie Downtown offered up a fresh selection of pieces by Pierre Jeanneret, Charlotte Perriand, Jean Prouvé, Serge Mouille and Georges Jouve. Rotterdam-based Galerie Vivid featured work by the likes of Sebastian Wrong, Ettore Sottsass and Olivier van Herpt this year. Highlights include Scholten & Baijing’s geometric marble tables and Mies van der Rohe’s 1923 ‘MR10’ chair. As part of Design Miami’s Curio programme, Salon 94 Design is unveiling work by sculptor Tom Sach. The artist has been making one-off furniture for over 30 years, although this showing marks his first foray into industrialised production. Inspired by the Japanese sawhorse, this collection of chairs and tables in plywood and Lexan have each been milled by a robot, the hand-finished in the studio. Installation view of Galerie Patrick Seguin’s booth at the main fairground. New York designer Bec Brittain is releasing new lighting with Patrick Parrish Gallery. Inspired by Japanese armour, ‘Kawari Crane’ is made out of curved glass.